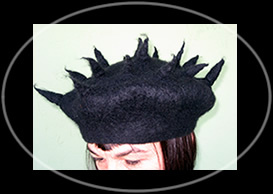 Experience as a sculptor, designer and ceramicist are all evident in the unique and graceful hats Phyllis Beals creates. Each hat is an arresting blend of color, shape, and texture, skillfully united with old world craftsmanship, and ranges from the classically beautiful to the wildly flamboyant with exotic ornamentation and intricately folded silken ribbons. The whimsy and spirit that makes these hats fun to wear has much to do with Phyllis's background in theatre, and her passionate love of music. Over the last several years Beals has expanded the production of her unusual wearable art for individual clients and selected stores. Her hats have been featured in articles and advertisements in a variety of magazines and newspapers including Elle magazine. Twiggy wore a Phyllis hat in the ads for the TV show "Princesses" in People, TV Guide, and US. In addition, Phyllis and her hats have been featured in stories in the Sacramento Bee, Buzz magazine, Mary Englebreit's Artist Newsletter and most recently in Ruth Dewson's book, Hats for Every Head, atop Congresswoman Nancy Pelosi. Alice Waters of Chez Panisse has been seen in magazines and television wearing a Phyllis hat. Beals's work reflects her diverse training and experience in the arts. Her early training was at the Montreal Museum School of Art and Design, studying animation, drawing and painting. She moved on to apprentice with potter/painter Jeanne Hastings in upstate New York, followed by The School For American Craftsmen at Rochester Institute of Technology in Rochester, N.Y. where she worked in clay and ceramic sculpture. She continued with ceramics at Skidmore College, exploring new sculptural techniques. The following years of travel and working in the arts in Persia and Europe left a lasting influence exhibited in her appreciation of traditional form and ornamentation. Her lifelong passion for hats and her wide-ranging knowledge of vintage clothing led her to curate the notable exhibit Hats, Ties and Socks at the UC Davis Design Gallery in the fall of 1990. Phyllis's work has been shown at a number of galleries and exhibitions. Included are the Himovitz/Miller Gallery, Sacramento, CA., Winkler Gallery, Sutter Creek, CA., the Slant Gallery Sacramento, Ca., Celebrations Gallery, San Diego, CA., Peaches and Regalia, Kansas City, MO., the Pacific States Craft Fair, S.F., CA., the Crocker Art Museum, Sacramento, CA., Salad Dressing: Haute Cuisine and Haute Couture show at Copia, Napa, CA., and the Head to Toe show at the Luckenbach Mill Gallery in Bethlehem, PA.
Phyllis uses various types of straws, fur felt as well as hand-made felt produced in her studio from Merino and Coriedale fleece to make her hats. She has amassed an extensive trove of rare antique ribbon and decorative material that often finds it way in. Each hat is unique and not reproduced. She has sold her hats at Fred Segal and Sumiko in Santa Monica, CA., Maxfields in LA, the Philadelphia Museum of Art, and numerous other stores. 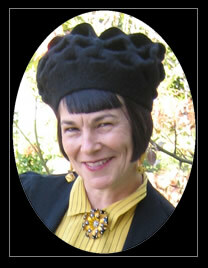 Currently Phyllis hats are available at Soiree and Lilith in Berkeley, CA., at the Sonoma County Museum gift shop and through the milliner by appointment.